​so after a good 3 years of dissecting meat I have now finished my first year of being a qualified tafe teacher teaching in the aboriginal and or Torres strate cultural arts class (the same course Geoff had arranged for me to do my work placement a few years earlier) I am going to continue to teach for as long as I can and continue my work as an artist and just go with the flow and see where it takes me. 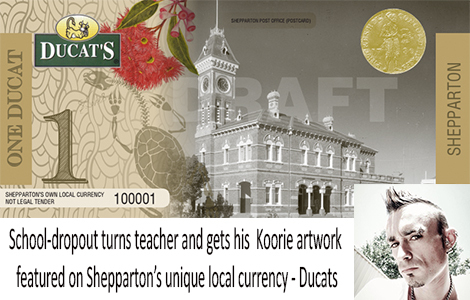 The flow...Shannon enthusiastically accepted a paid commission to design a local Koorie totem and background for the new Ducats Currency soon to be released in Shepparton. I chose a prehistoric look for the long neck turtle for its uniqueness and as its my totem of the Yorta Yorta clan, the prehistoric twist of my design is about how indigenous Australians are the longest surviving race in the world, we have been here for over 40,000 years so we are practically a prehistoric race and that we still thrive today and we still hold our traditions, art, language and beliefs.